A bear controlled expiry..New series and what to expect ?! Bears totally dominated october expiry in the last two weeks without giving any chance for the bulls. 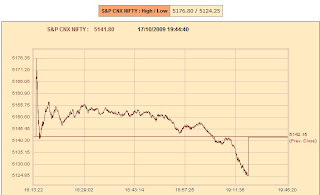 Even on the expiry day, bears proved their might in the last one hour of trade. 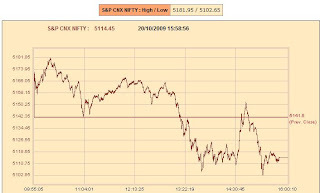 The main key was the break of 4900 levels and unwinding of the 4900 puts earlier which prompted for the bearish close for the expiry. Now that a new series has begun, it is likely that markets will give a bounce to 4950 levels in the short term and then might again get into the bearish mode. This is the indication as of now. It is not yet time to read the PCRs, but pattern suggests a move till 4950 which could act as a hard resistance level to break for the series. Bears to control the expiry also… 4734 expiry a possibility ?! Bears have been totally dominating the markets in the last few days and now the expiry day has arrived. Having had complete control till now, bears are less likely to give up and show their might for the expiry also. 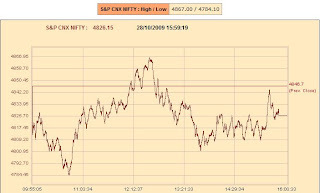 Yesterday’s session saw heightened volatility, but the expectation today is that bears would take complete control right from the beginning and would push Nifty to test lower levels of 4750 and even beyond. A test of 4705 levels is also not ruled out. The PCR for the series has declined to 0.93, completely in favour of bears. There are only very few expiry instances where the range has been more than 100 points and today there is a high possibility of more than a 100 points down intraday and a possible expiry at 4734 levels. Bears proved their strength..4900 broken decisively..What next for expiry ?! Bears completely conquered the 4900 fort and also showed immense strength to break it and close below that level. The close is also below the lower bollinger band and there has been a significant increase in volume. 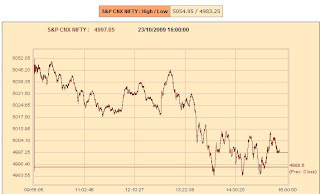 On the intraday charts there are multiple instances of bull traps at each key levels, 4955 and also just above 4900. For this series, the OI in 4900 puts were ruling very high at some stage and now that it has been decisively broken, as written before, it is a proof that the puts have moved from weak hands to strong hands. Even an expiry above 4900 looks remote at this stage. The overall PCR has come down to 1.02, though neutral, but the way it has decreased as the market came down favours bears. 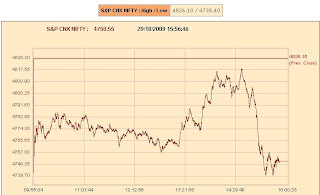 Bears to push Nifty to 4900 levels…and then a consolidation ?! 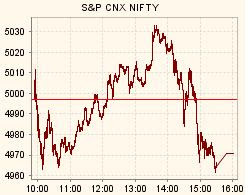 It was another day where bears took total control and pushed Nifty from the day’s high to close almost near the day’s low. It looks like bears can further push Nifty to test 4900 levels as written yesterday and there might then be consolidation at that level also. Yesterday again there was a strong bull trap seen at 5010 levels reiterating bears strength. The PCR stands at the same level of 1.12 and that is the main reason why there could be more of a consolidation around 4900 levels and markets might not yet crack down. Bears showing strength…Will 4900 be tested and broken before expiry ?! In the last week, each day had a move to trap the bulls at some higher level and then bears took total control to close almost near the day’s low. This clearly indicates that majority of the bulls are trapped at each level and friday’s intraday pattern also suggest that a strong bull trap is seen around 5050 levels which should act as a strong ceiling for this series. Looking at the PCR, it is now at 1.12, though not favouring bears much, but the fact remains that the PCR has been decreasing when the markets were under bears control last week. The OI in 4900 put which reached more than 70 Lakhs has now cooled off a bit to 53 Lakhs which could also mean that the strong hands which wrote the puts earlier could have covered and now there is a good chance of this market to retest 4900 levels before expiry. There will be no update for 23 Oct 2009. Sorry for the inconvenience caused. 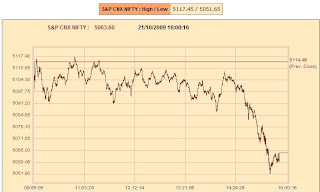 5050 levels reached…50:50 chance begins to favour bears?! Yesterday I had written that there will be a retest of 5050 levels and then it will be a 50:50 chance for the bulls and bears. Looking at the intraday pattern of the previous session where there was a strong bull trap at 5150 levels and also looking at yesterday’s pattern, where there is a bull trap at 5100 levels, it looks like bears are slowly taking the upperhand. The PCR is at 1.23, it has decreased from 1.33 levels of yesterday and more of the near strike puts has decreased OI and the same has increased for calls. This also indicates some sort of bearishness. It is a crucial session today and if the PCR further decreases at the end of the day and the day being bearish would signify a bearish move in the short term. Also the 20 DMA support is around 5040 levels and we should watch if Nifty closes below that level for the day. A retest of 5050 levels and then a 50:50 chance for bulls and bears ?! The intraday pattern of yesterday totally favours bears, a new high being tested and then a strong pull back and to add to that a very powerful bull trap at 5150 levels. It now looks like Nifty might fall again to test the 20 DMA around 5050 levels. The PCR ratio is at 1.33 which is favorable for the bulls and so a strong correction seems to be ruled out at this stage. That is why it looks like a 50:50 chance for the bulls and bears when 5050 level is breached. Will 5200 level be the ultimate upper ceiling for the near term ?? Nifty is traversing along the bollinger upper band for the past three sessions and it looks like it is getting over heated in the intermediate term. There will be strong resistance once 5200 level is breached and that will act as the upper ceiling for the intermediate term. 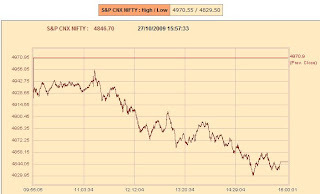 The option pain has slowly moved from 5000 levels to 5100 levels and there is a good possibility of Nifty retesting 5100 levels in a day or so. The PCR ratio is still in favour of bulls and is likely to change when Nifty reaches 5200 levels. 4900 put has an OI of 70 lakhs and that is going to act as a strong support for this month. Overall it is likely that Nifty will make another attempt to scale new high and is likely to fall from the levels of 5200.